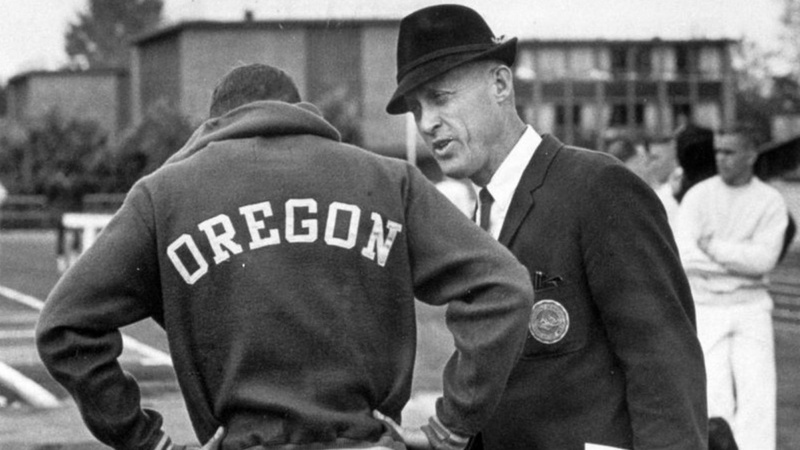 In their prime they were strong and fit, and they ran circles around the cinder track of Hayward Field under the watchful eyes of Bill Bowerman, war hero, legendary coach of Olympians, relentless innovator and co-founder of Nike. 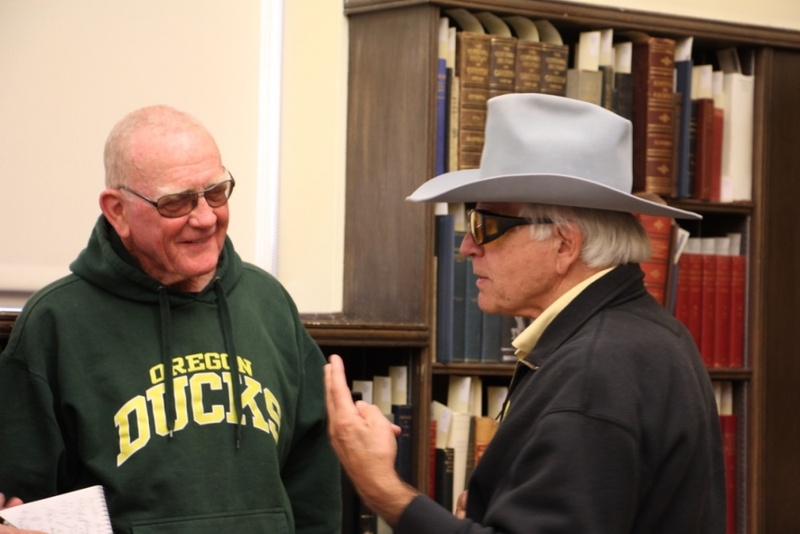 These were the original Men of Oregon, athletes who helped make Oregon a longstanding power in collegiate track and field. Today, they’re older, with less hair and more wrinkles, moving a bit slower but still with an athletic bearing. Every year for the last seven years they’ve reunited during the weekend of the NCAA Track and Field Championships, renting a house up the McKenzie River and coming into town for the meet at Hayward Field. 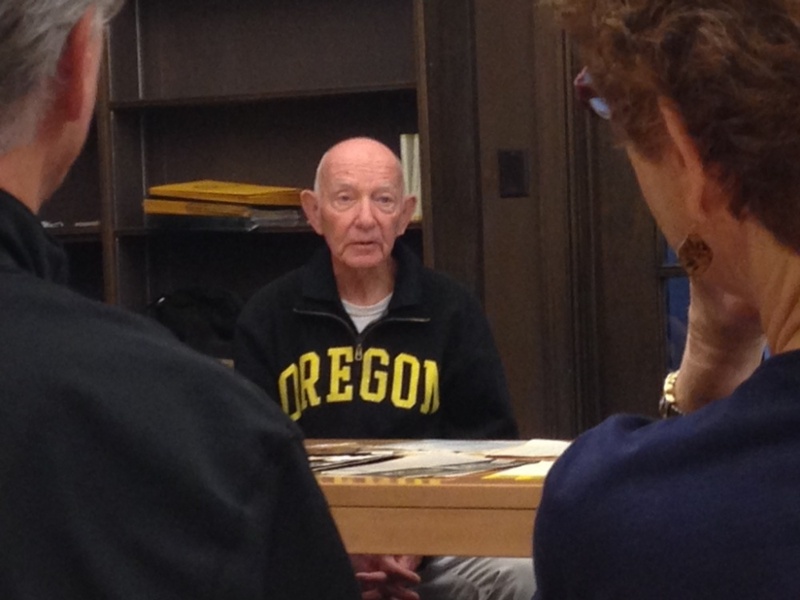 “We tell lies about how good we used to be,” said Gene “Red” Estes, who threw discus for Oregon in the late 1950s. 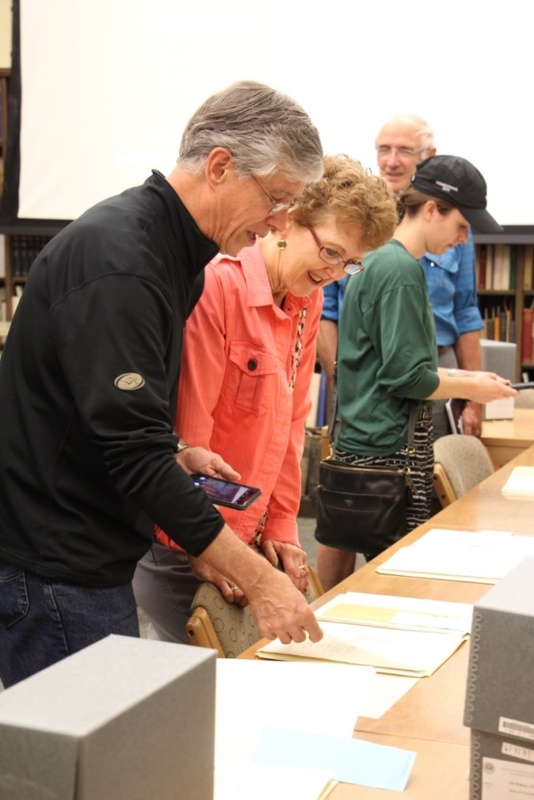 This year, 11 of them made a side trip to Knight Library, gathering in the Ken Kesey Classroom in Special Collections and University Archives. Letters, notes, programs and track paraphernalia from the Bowerman collection were spread out on tables. It was a chance to visit, reminisce and tell stories about their coach — who insisted that people call him Bill, not coach. “He was a genius in his approach to track and field,” Estes said. Bowerman was a meticulous note taker and letter writer and kept voluminous files on all his athletes, said archivist Lauren Goss. 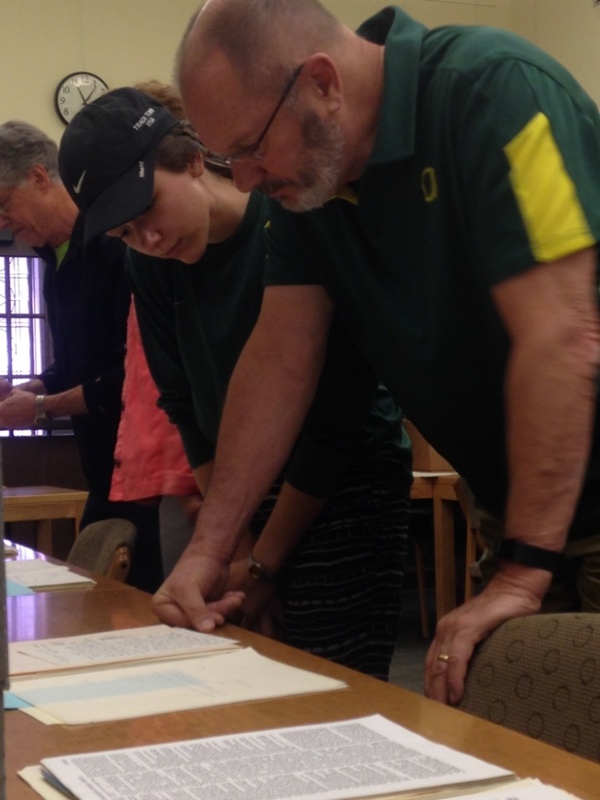 The material includes 100 boxes of letters to recruits, training notes and programs, plus films, plaques, singlets and other remnants of his 23-year career at Oregon. 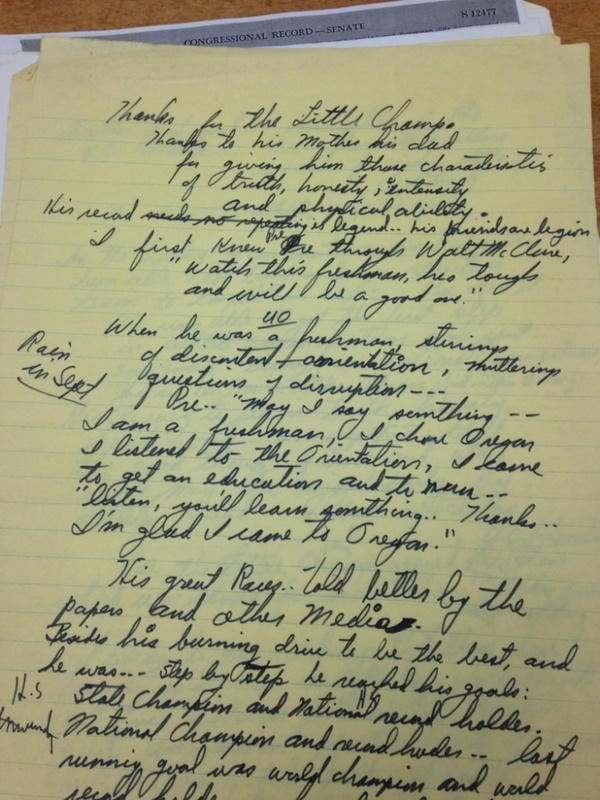 “Dear Steve,” begins one letter, dated Oct. 30, 1967, to a high school phenom from Coos Bay named Steve Prefontaine. 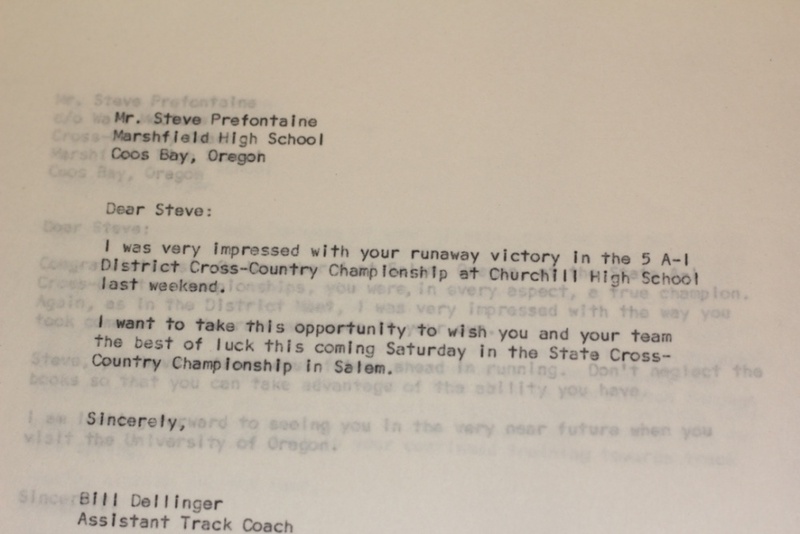 Bowerman told Pre he wasn’t able to attend the high school district races, but his assistant, Bill Dellinger, and several current Oregon runners watched. Prefontaine, of course, would come to Oregon and establish himself as arguably the university’s most enduring sports legend. Goss showed the group a sampling of some of film clips she’s uncovered, including Bowerman leading off the mile relay for Oregon in 1933 in the North Division Championship; Bowerman fishing with Bill Hayward, his predecessor as track coach and namesake of the track stadium; Dyrol Burleson running the first sub-4-minute mile at Hayward in 1960; and Prefontaine running a 3:56.8 mile at Hayward in Nike shoes in 1973. “That was a big thrill,” he said. 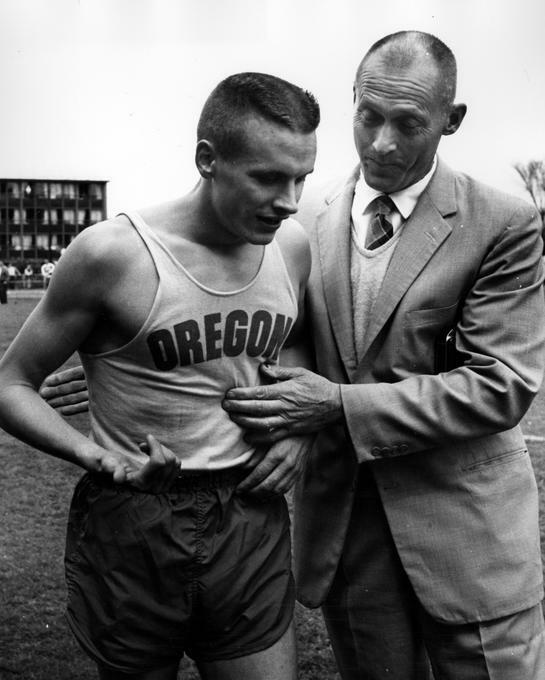 Gary Lineburg, who came to Oregon from Oak Harbor High School in Washington, had his best collegiate result when he won the 880 in a dual meet at the University of Southern California around 1966. He remembers Bowerman congratulating him after the meet. “I didn’t have the nerve to tell him I was German,” Lineburg said. 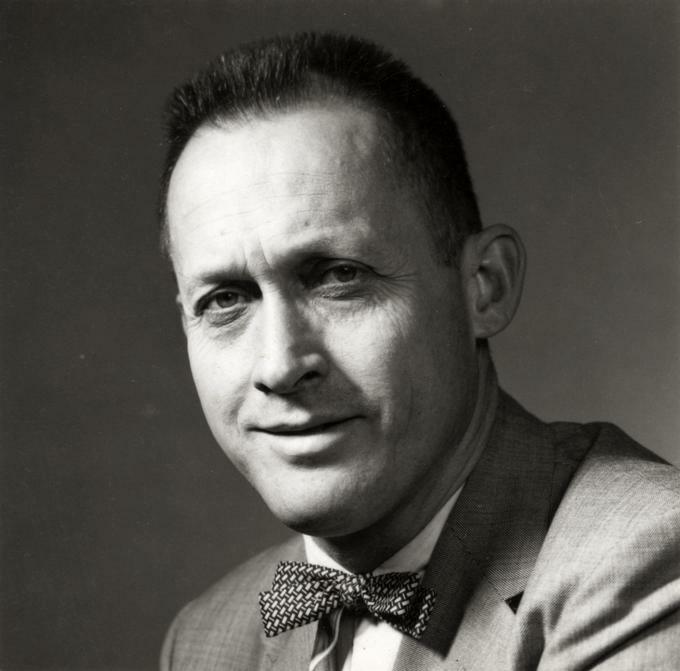 After throwing discus at Oregon from 1955-59, Estes served as a graduate assistant on Bowerman’s staff. His wife, Myrna, would help Bowerman make shoes for the athletes. Later, Bowerman helped Estes get hired at Fresno State, where he was head cross-country coach for 33 years and head track coach for 15 years. 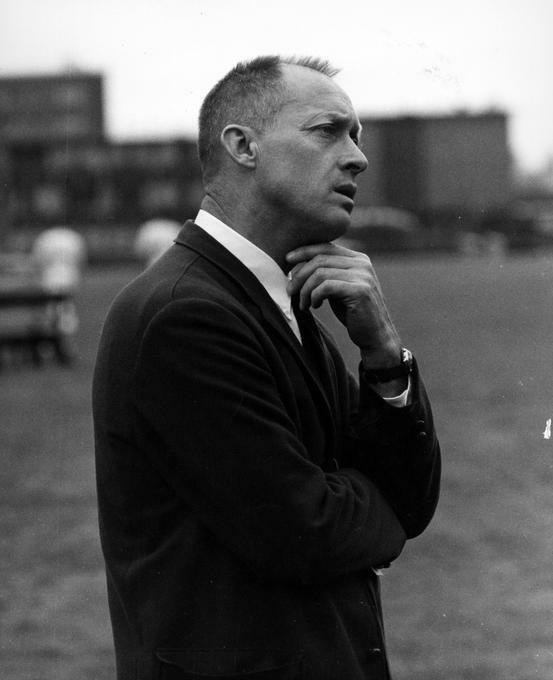 Bowerman was a relentless innovator, he recalled. He came up with hurdles that would tip over when runners struck them, replaced the sawdust in jumping pits with foam padding, and started using offset pole vault bars, which made the event safer for athletes as they came back to ground. And, of course, Bowerman partnered with one of his former athletes, Phil Knight, to form Blue Ribbon Sports, the shoe company that would later become Nike. After he got hired at Fresno State, Estes said he called up Bowerman to see about getting some of the shoes he and Knight were importing from Japan. Estes drove up with his wife and kids and dog in the family station wagon to Knight’s parents’ house in Portland, where Knight was living while running his new shoe business. As he and Knight were loading the shoes into the station wagon, Knight told him he should take some extra pairs back to Fresno to sell. Knight said he’d been selling them out of his trunk at cross-country meets and they were going like hotcakes. Estes was skeptical.